The day the pigs and granddad ran away. My mums name is Dolores Henderson now but back in 1970 she was known as Dolores Mc Dermott. A little back ground to my mum. She lived in a Place called Corrigeenboy near Ballyfarnon, Co. Roscommon. This rural area was made up of small farmers. Children helped on the farms. After her dad died in the house lived my mum, her mum and her granddad aged 89 years. The day my mum remembers very clearly even to this day was the day she was left in charge of the house. Her mum had to go to Boyle which to my mum sounded like it was America as she had gone no further than Geevagh, Ballyfarnon or Kilmactranny where she attended National School. Her mums transport was the bicycle. She was told to do the different jobs like feeding the calves, hens and pigs. She also had to go to the well for water. The well was about one and a half miles away but this had to be done everyday for clean water. The most important job was to watch her grandfather every minute of the day because as they said them days he was doting and would wander away. Mum told me when he got away he could walk very fast and she was not able to keep up with him. Things were going well calves fed, cows got water, hens were feed. Time to check granddad and he was ok. He told mum he would help her with the pigs so mum was delighted with the help. Food ready off to the shed they go. Granddad opens the door wide and what happens next was!!! Sow and she thinks it was 10 or 11 piglets get lose. Out of the shed they run, down the lane to the crossroads and in all directions after that. Mum was running trying to catch them but could not. Her granddad was left. Help came to mums aid from the neighbours . The day was spent looking for sow and piglets. Her Mum arrived home on her bicycle from Boyle and not pleased with the sight! no Grandfather, no Dolores and shed door wide open. Many hours later sow and piglets were back safe in the shed but Granddad was still missing and it was getting dark. Cows had to be milked so mum went to get them from the field while the neighbours said they would look for her grandfather. Mum arrived at the gate of the field and who was inside the hedge but her granddad. She took him home and got given out to for causing such mayhem that day. 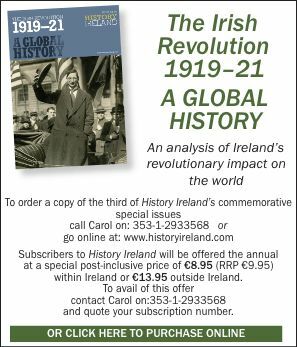 Dolores Henderson has given permission for her name to be published by the history of Ireland website.